Hebraist and author; born in London 1742; died 1801. He was destined by his parents for the rabbinate; but the design was abandoned, and he was apprenticed to a shoemaker. Subsequently he set up in business for himself as a hatter; but, meeting with considerable losses, heabandoned this business and turned his attention to dressing the material for men's hats. Meantime he continued to pursue his studies in Hebrew, especially in the Prophets. 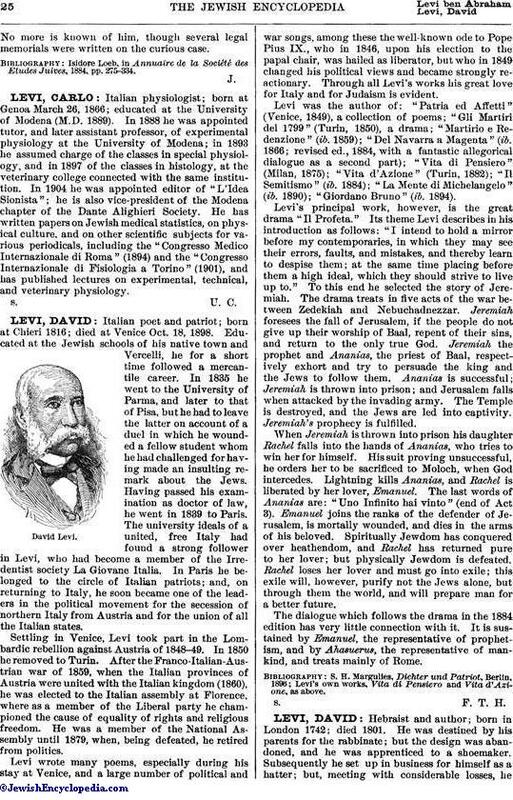 From 1783 to 1797 Levi was busily engaged in issuing a series of works (a list of which is given below) dealing with Jewish theology, grammar, and ritual. He rendered great services to the London Jews in translating their prayers into English and in vindicating their faith against the onslaughts of Dr. Priestley and Thomas Paine. His works present a remarkable instance of industry and perseverance under adverse conditions. During the latter part of his life he followed the business of a printer. 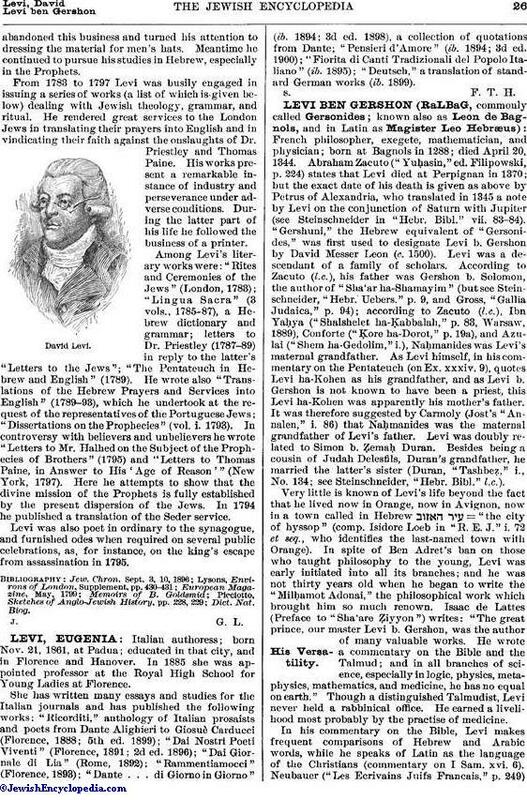 Among Levi's literary works were: "Rites and Ceremonies of the Jews" (London, 1783); "Lingua Sacra" (3 vols., 1785-87), a Hebrew dictionary and grammar; letters to Dr. Priestley (1787-89) in reply to the latter's "Letters to the Jews"; "The Pentateuch in Hebrew and English" (1789). He wrote also "Translations of the Hebrew Prayers and Services into English" (1789-93), which he undertook at the request of the representatives of the Portuguese Jews; "Dissertations on the Prophecies" (vol. i. 1793). In controversy with believers and unbelievers he wrote "Letters to Mr. Halhed on the Subject of the Prophecies of Brothers" (1795) and "Letters to Thomas Paine, in Answer to His 'Age of Reason'" (New York, 1797). Here he attempts to show that the divine mission of the Prophets is fully established by the present dispersion of the Jews. In 1794 he published a translation of the Seder service. Levi was also poet in ordinary to the synagogue, and furnished odes when required on several public celebrations, as, for instance, on the king's escape from assassination in 1795.